There was fun, frolics, music, dance and theatrics at the weekend as hundreds of performers turned out to support a festival that honours all that is great about the Granite City. Union Terrace Gardens, the Central Library, the Academy Centre and St Mark’s Church were just a few of the spots transformed into temporary stages for Celebrate Aberdeen. 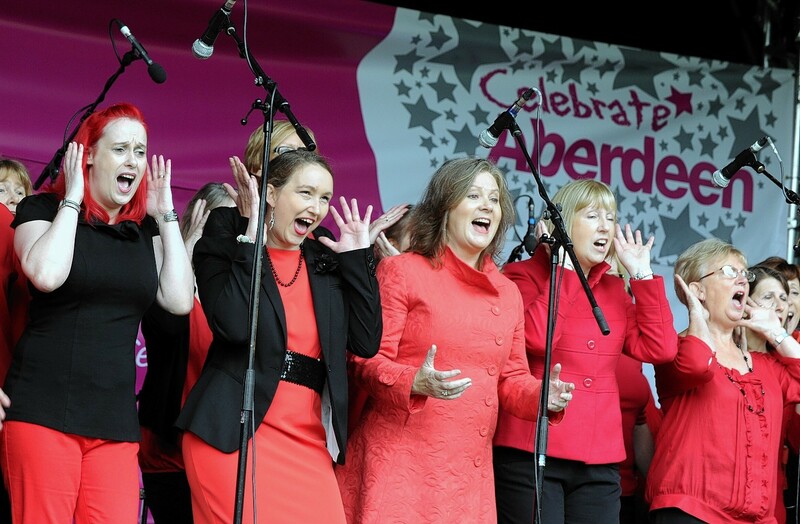 The event was organised following three successful years of the Celebrate Aberdeen parade, a celebration of third sector groups in the city and all that they do. More than 3,500 people walked down Union Street during the parade last year. And this year’s new event appeared to be just as successful, showing off a host of north-east talent. Last night, Scott Baxter, of Celebrate Aberdeen, said it had been a huge success, and thanked all those who gave up their time to perform and support such a worthy cause. “The weekend has been absolutely brilliant in terms of everybody getting involved and helping out, particularly the volunteers,” he said. “All the performers gave up their time for free, and there was a tremendous array of genres on show. The festivities kicked off at 10am on Saturday, with performances from around 40 different acts during the day, including rock cover band Voodoo Vibe, barbershop choir Sweet Adelines, singer Daniel Mutch and the Iron Broo ceilidh band. The rain did not deter hundreds of people who flocked to the city-centre. Yesterday, singer Cara Mitchell, the Kincorth Brass Band, magician Eoin Smith and the Newtonhill Pipe Band were just a few of the acts on offer. There was also a pop-up wrestling ring set-up at Union Terrace Gardens for a display from Wrestlezone, a professional wrestling company based in Aberdeen that runs monthly shows throughout Scotland. North-east folk and rock band The Lorelei also performed a set, while the North East Clarsach Society rounded off the day’s entertainment. Mr Baxter said it was a day to be proud of.